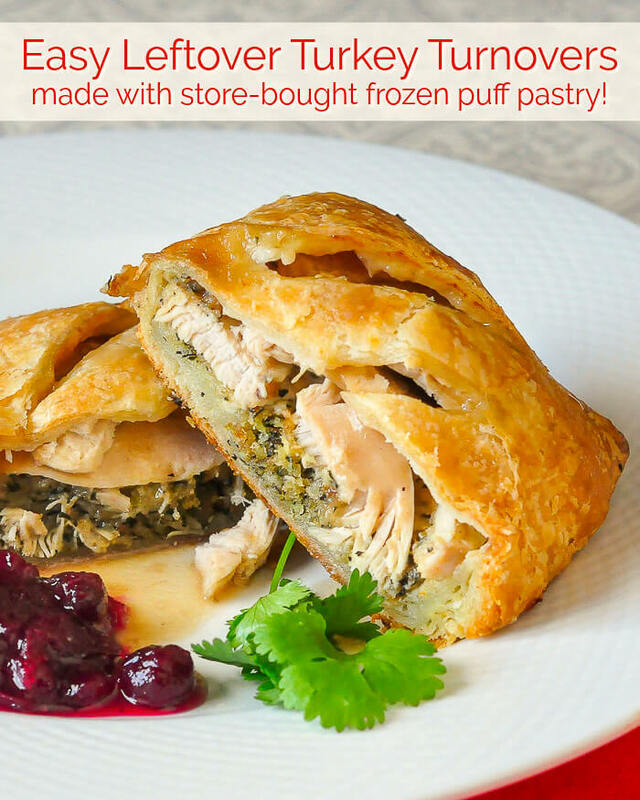 Leftover Turkey Turnovers - so easy to make using frozen puff pastry! Leftover Turkey Turnovers. One of 25 Leftover Turkey Ideas. Some frozen puff pastry plus the leftovers from a roast turkey or chicken dinner combine in these easy to make turnovers. Originally published January 7, 2012. Updated Nov 24, 2017 to include link to 25 Leftover Turkey Ideas. 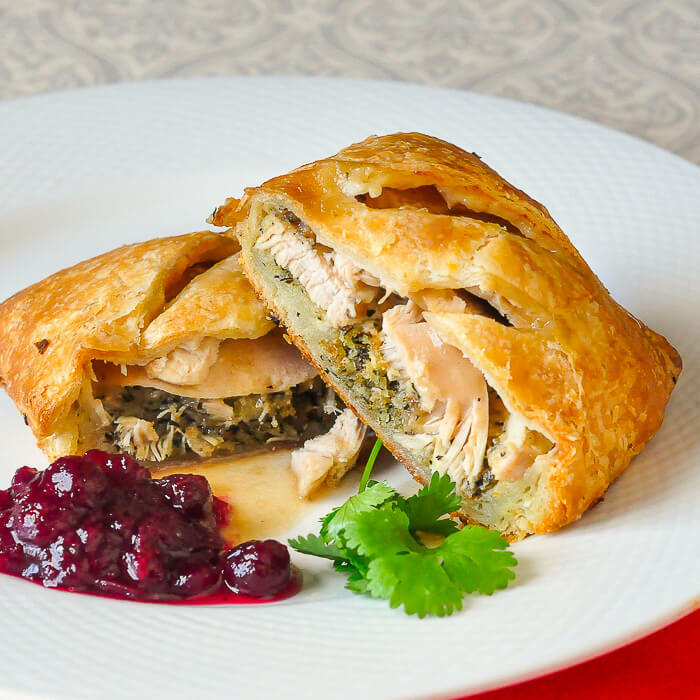 Leftover Turkey Turnovers; in the post Christmas haze, I still managed to add to my growing collection of leftover turkey recipes and this one was a real winner. 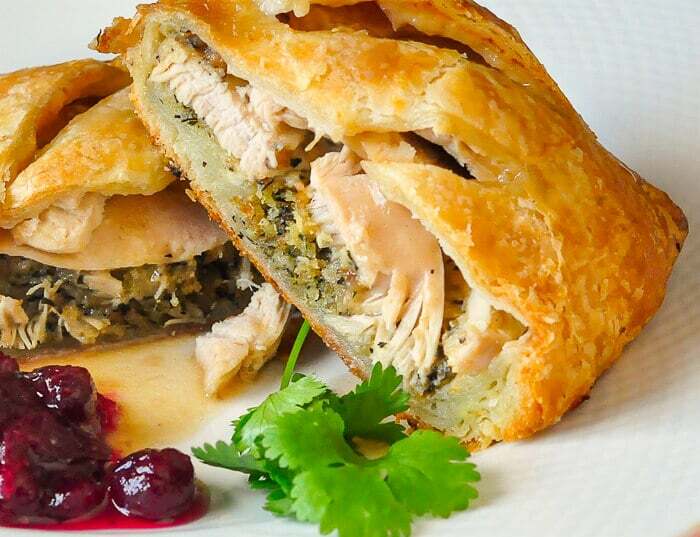 I made these with leftover turkey, gravy and stuffing from a roast turkey dinner on New Years Day and they couldn’t be simpler to make, especially with store bought puff pastry. I even made them in advance and stored them wrapped on a cookie sheet in the refrigerator overnight. The next day, they simply got popped into a hot oven for about a half hour after I got home from work. Some mashed potatoes and a little homemade cranberry orange sauce rounded out this amazing comfort food meal. My family raved about these turnovers and they will no doubt be sampled many times at our house in the future. 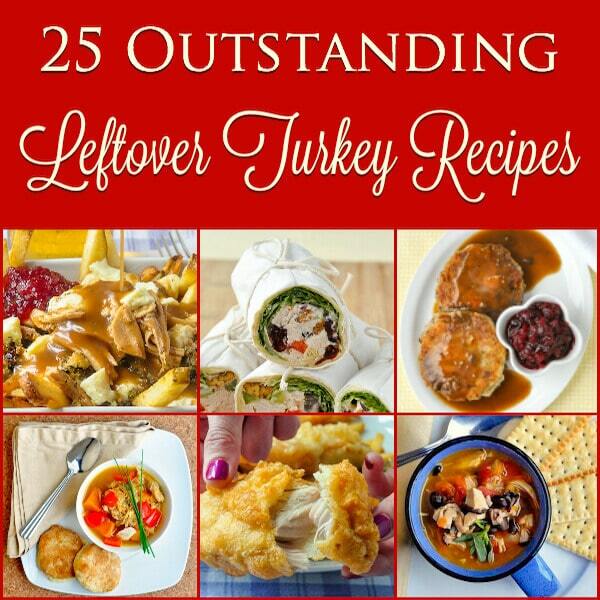 For our other delicious and different leftover turkey recipe ideas, click here. 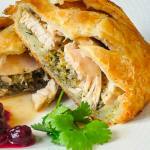 Like this Leftover Turkey Turnovers recipe? Leftover Turkey Turnovers - some frozen puff pastry plus the leftovers from a roast turkey or chicken dinner combine in these easy to make turnovers. Roll pastry sheets out to about 14 inches square. Cut the sheet in half to make 2 square turnovers. Begin placing sliced turkey about 2 inches from the edge in the center of the pastry. Fan the turkey slices out to cover half of the pastry rectangle. As you place each slice of turkey down, to it with a spoonful of turkey gravy, so that there is gravy between all the turkey slices. Top the turkey with about a half cup of leftover stuffing. Brush all the edges with an egg wash made from whisking together 1 egg and 2 tbsp water. Bring the two edges of the dough together until they overlap at least an inch over the top of the turkey and stuffing. Fold the remaining open edges toward the center overlapping about half an inch to an inch. Flip the entire turnover over so that the seams are on the bottom and place on a parchment lined cookie sheet a couple of inches apart. Cut a couple of 1 inch slits in the top of the pastry and refrigerate for 20-30 minutes to make sure the pastry is very cold when it is popped into a 425, degree F oven for 20 minutes before turning the heat down to 350 degrees F for an additional 10 minutes or until the gravy begins to bubble and the pastry is evenly golden brown. Remove from oven and let rest for 10 minutes to cool before serving. Hi, what kind of Puff Pastry do you use? Thanks! As long as it’s real butter pastry I use any kind. Presidents choice is probably the one I use most.